Proposals, wedding parties, bridal showers, oh my! Adeline’s Sea Moose is an exquisite, mid-sized vessel perfect for a wide range of romantic yet luxurious events. This state-of-the-art, 68-foot yacht offers four levels of pristine waterfront entertainment space ideal for those memorable moments with your partner and loved ones. 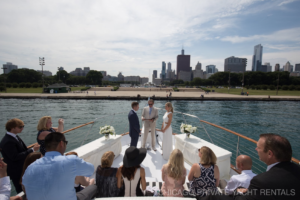 Get down on one knee overlooking a stunning Chicago skyline as the Adeline’s Sea Moose cruises along the shoreline on the padded sun-deck or head up to the intimate fly bridge and lounge area which offers 360 viewing. After the proposal, it’s time to celebrate with your closest family and friends! Show off the newest symbol of your love and enjoy a relaxing and fun ride in the river as our vessel takes you around the city. Guests can celebrate indoors or outdoors with a glass of champagne or a cocktail from the top shelf premium bar. Get together with friends and loved ones for a bridal shower or joint couples shower you’ll never forget. Make it a fun day out and take a dip off the Adeline’s Sea Moose swim platform! Ready for a fun, wild night out with your wedding party? Our private yacht houses indoor and outdoor surround sound systems to keep everyone on their feet, a top shelf premium bar, and three flat screen TV sets. Host your own private luncheon for your brides and groomsmen aboard the Adeline’s Sea Yacht, where we offer a variety of catering packages that can be specially crafted to your party’s needs. A great way to kick-off the start of your wedding is with a pre-wedding party for your guests. Adeline’s Sea Moose seats up to 45 guests, who can lounge outdoors on the sun deck or fly bridge, or inside in one of the comfortable staterooms, the modern galley, or the living room and entertainment area. Prepare for the big day aboard our yacht with the love and support from your friends and family during a special rehearsal dinner under the stars. Choose from one of our catering options for the best dishes available to make for a memorable occasion. The moment has finally arrived and you’re ready to say “I do”! 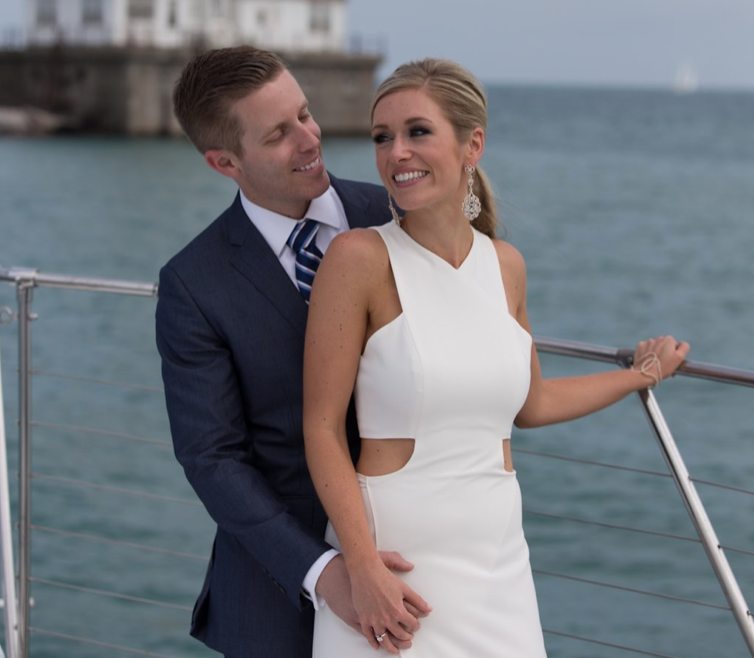 Capture this intimate moment with spectacular panoramic views perfect for wedding photo backdrops, a premium top shelf open bar, specially curated catering options, a champagne toast, drone footage, and an ultimate personalized experience for the start of a new adventure. Adeline’s Sea Moose wedding charter welcomes the bride-to-be access to the below deck one hour before departure to the bridal suite for complimentary champagne. The ceremony may be over, but the party doesn’t have to stop! Keep the fun going and drinks coming all night on the Adeline’s Sea Moose. Treat yourself and your guests to a delicious brunch for a post-wedding get-together to unwind after the wedding chaos! Did your wedding day fly by too quickly? Make your celebration last with a relaxing and stress-free second-day wedding with close friends and family. Our professional crew can help you plan the best second-day wedding after the wedding party so you breathe easy! Whether it’s a one-year or fifty-year anniversary, keep the memories coming aboard Adeline’s Sea Moose. Take a Chicago river tour, an architectural lakefront tour, a historical destination tour, or just cruise with your partner into a blissful Chicago sunset. We have more than enough information to share with you.